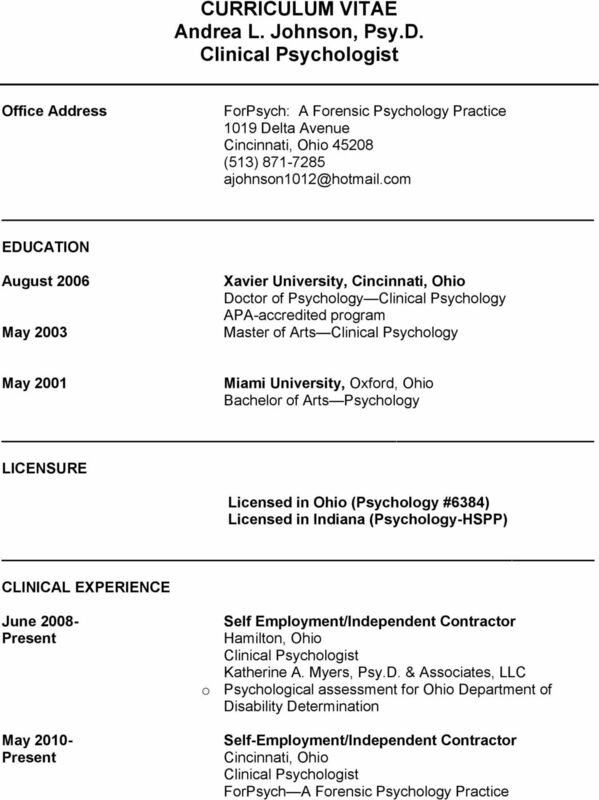 Download "CURRICULUM VITAE Andrea L. Johnson, Psy.D. 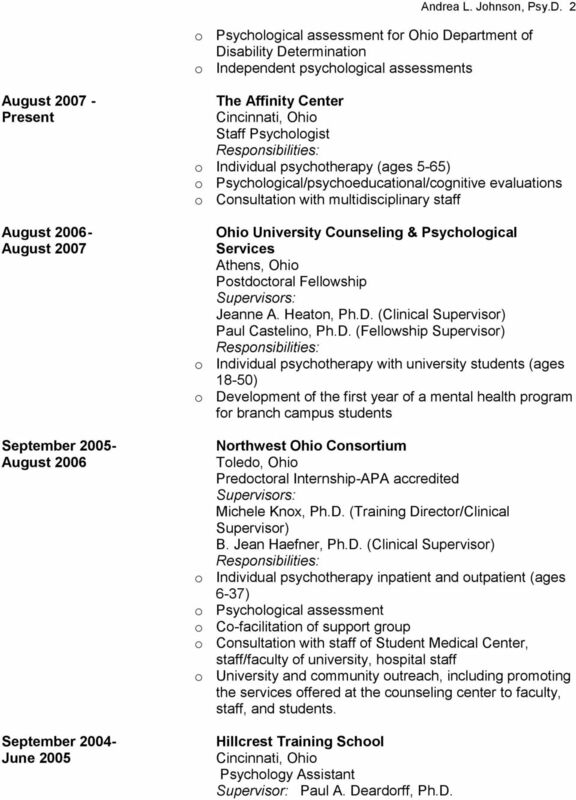 Clinical Psychologist"
2 Andrea L. Johnson, Psy.D. 2 o Psychological assessment for Ohio Department of Disability Determination o Independent psychological assessments - August September August 2006 September The Affinity Center Staff Psychologist o Individual psychotherapy (ages 5-65) o Psychological/psychoeducational/cognitive evaluations o Consultation with multidisciplinary staff Ohio University Counseling & Psychological Services Athens, Ohio Postdoctoral Fellowship Jeanne A. Heaton, Ph.D. (Clinical Supervisor) Paul Castelino, Ph.D. (Fellowship Supervisor) o Individual psychotherapy with university students (ages 18-50) o Development of the first year of a mental health program for branch campus students Northwest Ohio Consortium Toledo, Ohio Predoctoral Internship-APA accredited Michele Knox, Ph.D. (Training Director/Clinical Supervisor) B. Jean Haefner, Ph.D. (Clinical Supervisor) o Individual psychotherapy inpatient and outpatient (ages 6-37) o Psychological assessment o Co-facilitation of support group o Consultation with staff of Student Medical Center, staff/faculty of university, hospital staff o University and community outreach, including promoting the services offered at the counseling center to faculty, staff, and students. 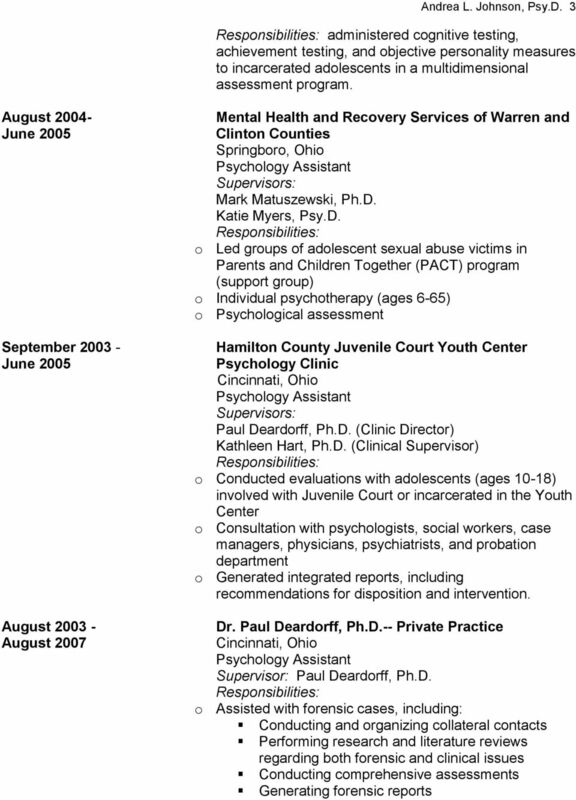 Hillcrest Training School Supervisor: Paul A. Deardorff, Ph.D.
5 Andrea L. Johnson, Psy.D. 5 February 2002 Substance Abuse Issues in Mental Health Treatment Gary Schneider, Ph.D. & Linda Bodie, Psy.D. 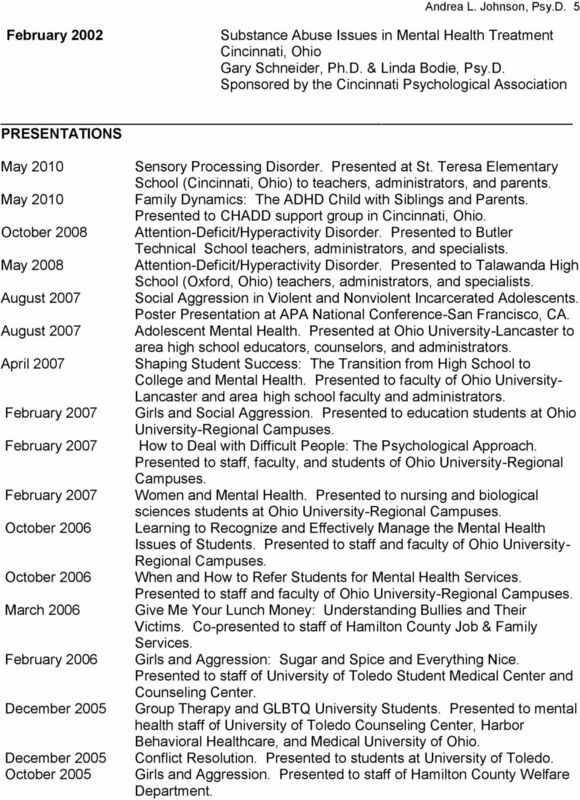 Sponsored by the Cincinnati Psychological Association PRESENTATIONS May 2010 May 2010 October 2008 May 2008 April 2007 October 2006 October 2006 March 2006 February 2006 December 2005 December 2005 October 2005 Sensory Processing Disorder. ed at St. Teresa Elementary School () to teachers, administrators, and parents. Family Dynamics: The ADHD Child with Siblings and Parents. ed to CHADD support group in. Attention-Deficit/Hyperactivity Disorder. ed to Butler Technical School teachers, administrators, and specialists. Attention-Deficit/Hyperactivity Disorder. ed to Talawanda High School (Oxford, Ohio) teachers, administrators, and specialists. Social Aggression in Violent and Nonviolent Incarcerated Adolescents. Poster ation at APA National Conference-San Francisco, CA. Adolescent Mental Health. ed at Ohio University-Lancaster to area high school educators, counselors, and administrators. Shaping Student Success: The Transition from High School to College and Mental Health. ed to faculty of Ohio University- Lancaster and area high school faculty and administrators. Girls and Social Aggression. ed to education students at Ohio University-Regional Campuses. How to Deal with Difficult People: The Psychological Approach. ed to staff, faculty, and students of Ohio University-Regional Campuses. Women and Mental Health. ed to nursing and biological sciences students at Ohio University-Regional Campuses. Learning to Recognize and Effectively Manage the Mental Health Issues of Students. ed to staff and faculty of Ohio University- Regional Campuses. When and How to Refer Students for Mental Health Services. ed to staff and faculty of Ohio University-Regional Campuses. Give Me Your Lunch Money: Understanding Bullies and Their Victims. Co-presented to staff of Hamilton County Job & Family Services. Girls and Aggression: Sugar and Spice and Everything Nice. ed to staff of University of Toledo Student Medical Center and Counseling Center. Group Therapy and GLBTQ University Students. ed to mental health staff of University of Toledo Counseling Center, Harbor Behavioral Healthcare, and Medical University of Ohio. Conflict Resolution. ed to students at University of Toledo. Girls and Aggression. ed to staff of Hamilton County Welfare Department. 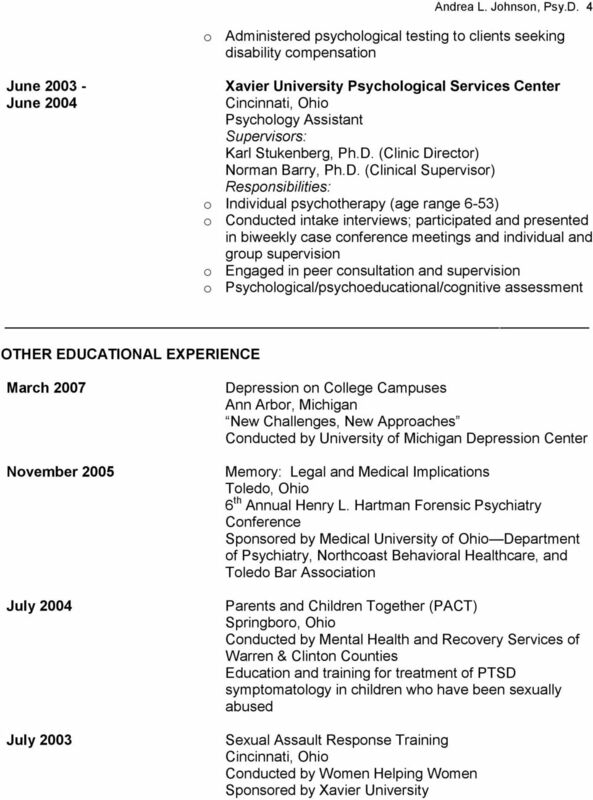 CURRICULUM VITAE Elaine A. Thomas, Psy.D. 316 Alexander Street, Suite 6 Marietta, GA 30060 (770) 216-0460 Licensed Psychologist, GA PSY#0002936 Licensed Psychologist, CA PSY#17506 EDUCATION 1995 Psy.D. Post Doctoral Fellowship in Forensic Psychology Mendota Mental Health Institute & Sand Ridge Secure Treatment Center 301 Troy Drive Madison, Wisconsin 53704 Table of Contents Overview..3 Training Program..
Argosy University, Twin Cities 1515 Central Parkway Eagan, MN 55121 www.argosy-psyd.com Passcode: 5DCODE College of Psychology and Behavioral Sciences Financial Aid is available to those who qualify. CURRICULUM VITAE. Susan M. Esp, Ph.D.